Are antidepressants useful for functional abdominal pain? Pérez González E, Molina Arias M. Are antidepressants useful for functional abdominal pain? Rev Pediatr Aten Primaria. 2018;20:287-90. Perdikidis Oliveri L. Tonsillectomy reduces moderately the frequency of tonsillitis, but it must be evaluated case by case. Rev Pediatr Aten Primaria. 2018;20:189-91. Can the diagnosis of celiac disease be based on serologic tests alone? Molina Arias M, Pérez-Moneo Agapito B. Can the diagnosis of celiac disease be based on serologic tests alone? Rev Pediatr Aten Primaria. 2018;20:79-82. Orejón de Luna G, Cuestas Montañés E. Can we predict which children with pneumonia will have a severe prognosis? Rev Pediatr Aten Primaria. 2017;19:279-81. Albi Rodríguez MS, Aparicio Rodrigo M. Early egg and peanut introduction appears to reduce allergy risk. Rev Pediatr Aten Primaria. 2017;19:83-5. Esparza Olcina MJ, Orejón de Luna G. Myths and realities of primary tooth eruption. Does it really produce so many symptoms? Rev Pediatr Aten Primaria. 2016;18:375-7. Buñuel Álvarez JC. There is no evidence to recommend azithromycin to prevent recurrent wheezing after bronchioliti. Rev Pediatr Aten Primaria. 2015;17:369-72. Ochoa Sangrador C, Rivas Fernández MA. Role of vitamin D in recurrent otitis of children. Rev Pediatr Aten Primaria. 2015;17:275-80. Pérez-Moneo Agapito B, Ruiz-Canela Cáceres J. What markers are useful as predictors of renal scarring in children with urinary tract infection? Rev Pediatr Aten Primaria. 2015;17:167-70. Díaz Cirujano AI, Ruiz-Canela Cáceres J. Timpanostomy tubes and adenoidectomy improve hearing in the short term in children with otitis media with effusion. Rev Pediatr Aten Primaria. 2015;17:71-4. Gimeno Díaz de Atauri Á, Modesto i Alapont V. The varicella vaccination programme decreases the rate of pediatric severe varicella, but it does not change herpes zoster related hospitalizations. Rev Pediatr Aten Primaria. 2014;16:247-50. Aizpurua Galdeano P, Rivas Fernández MA. Is there any relationship between the use of acellular pertussis vaccines and the latest outbreaks of pertussis? Rev Pediatr Aten Primaria. 2014;16:81-4. Should we treat otitis with delayed antibiotics in infants? Llerena Santa Cruz E, Ruiz-Canela Cáceres J. Should we treat otitis with delayed antibiotics in infants? Rev Pediatr Aten Primaria. 2013;15:271-3. Ruiz-Canela Cáceres J, Aizpurua Galdeano P. In a whooping cough epidemic, is cocooning a useful strategy? Rev Pediatr Aten Primaria. 2013;15:163-7.
de Lucas García N. Is it useful teaching CPR at school age? Rev Pediatr Aten Primaria. 2013;15:83-8. In infants, is the universal ultrasound screening more useful than the selective one to detect the developmental dysplasia of the hip? Flores Antón B, Ortega Páez E. In infants, is the universal ultrasound screening more useful than the selective one to detect the developmental dysplasia of the hip? Rev Pediatr Aten Primaria. 2012;14:343-50. Esparza Olcina MJ, Benito Herreros AM. Cranberry preparations, safe but of doubtful effectiveness for urinary tract infection in children. Rev Pediatr Aten Primaria. 2012;14:265-73. Buñuel Álvarez JC, Guarch Ibáñez B, Llerena Santa Cruz E. In children with infantile colic, probiotics do not seem to reduce the duration of crying. Rev Pediatr Aten Primaria. 2012;14:83-87. Gimeno Díaz de Atauri Á, González Rodríguez MP. In allergic children with asthma or rhinitis, is immunotherapy useful? Rev Pediatr Aten Primaria. 2011;13:459-69. 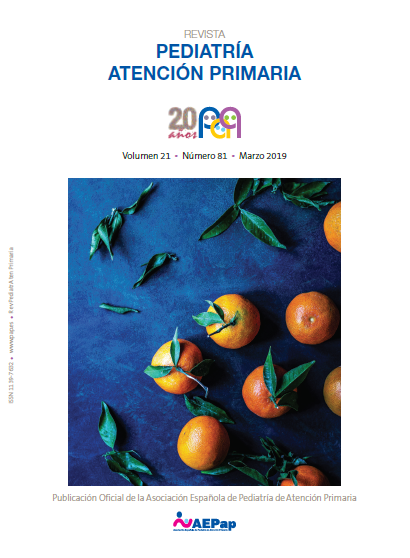 Orejón de Luna G, Pavo García MR. Is it possible to predict clinically which children may have intracranial complications after suffering a mild head trauma? Rev Pediatr Aten Primaria. 2010;12:483-94. Grupo de Trabajo de Pediatría Basada en la Evidencia, Asociación Española de Pediatría (AEP), en representación de la Asociación Española de Pediatría de Atención Primaria (AEPap). Technical report in Pediatrics on the pandemic flu A(H1N1). Summary of the recommendations [extract]. Rev Pediatr Aten Primaria. 2009;11:485-90. Is antibiotic prophylaxis necessary in children with mild to moderate vesicoureteral reflux, II-III grade? Aparicio Rodrigo M. Is antibiotic prophylaxis necessary in children with mild to moderate vesicoureteral reflux, II-III grade? Rev Pediatr Aten Primaria. 2009;11:289-98. Children with idiopathic short stature, have to be treated with growth hormone? Sánchez Andrade R, González Rodríguez MP. Children with idiopathic short stature, have to be treated with growth hormone? Rev Pediatr Aten Primaria. 2008;10:499-512. Is this child suffering a urine infection? Ruiz-Canela Cáceres J, Juanes de Toledo B. Is this child suffering a urine infection? Rev Pediatr Aten Primaria. 2008;10:135-9. How much does child day-care center attendance increases the risk of acute otitis media? Ochoa Sangrador C. How much does child day-care center attendance increases the risk of acute otitis media? Rev Pediatr Aten Primaria. 2007;9:683-91. Buñuel Álvarez JC. Efficiency of orthotic treatment in positional plagiocephaly. Rev Pediatr Aten Primaria. 2006;8:283-93. González Rodríguez MP. Diminishing pain during venipunctures in children. Rev Pediatr Aten Primaria. 2006;8:127-138. Buñuel Álvarez JC. Anticonvulsive drug´s efficacy in preventing recurrences in simple febrile seizures in children. Rev Pediatr Aten Primaria. 2005;7:441-450. Buñuel Álvarez JC. Symptomatic treatment of cough in children with upper respiratory tract infection. Rev Pediatr Aten Primaria. 2004;6:469-473. Colaboración Cochrane. Topical care of umbilical cord in the newborn. Rev Pediatr Aten Primaria. 2003;5:433-438. Buñuel Álvarez JC, González Rodríguez MP. Bibliografic research through internet. The way to find the best evidence existing: database of evidence based Medicine. Rev Pediatr Aten Primaria. 2003;5:109-132. Buñuel Álvarez JC. In children under 3 years of age with acute infectious gastroenteritis, the administration of Lactobacillus was effective diminishing the duration of the condition as well as the number of stools/day. Rev Pediatr Aten Primaria. 2002;4:631-637. Colaboración Cochrane. Interventions to prevent obesity in children. Rev Pediatr Aten Primaria. 2002;4:281-290. Buñuel Álvarez JC. Banks of critical appraised topics; what are they and what are they for. Rev Pediatr Aten Primaria. 2002;4:115-121. Colaboración Cochrane. Desmopressin in nocturnal enuresis in children. Rev Pediatr Aten Primaria. 2002;4:107-113.